Gloria had been on the hunt for a large dresser for a while now. She spotted one recently at one of our favorite stores, Charleston Attic Mall. If you’re ever in Charleston, it’s a great place to visit to just browse or find great prices on lots of used furniture, collectibles and unique items. She knew what style she wanted and she was happy to find one in that style. It was the wrong color and in need of some minor repairs, but that just meant that it would be a great project! I think what really sold her on this piece was the scallop at the bottom. It is pretty and with all those drawers, it will give her the storage she needs. It’s sturdy and well built. But, the white paint and brass knobs are not her style at all. When I pulled the drawers out, I discovered that several of the metal tracks were a little out of whack. I showed them to my husband and asked for advice on how to fix them. That’s a good way of asking for a little help! He removed them and all they needed were some new screws to have them fit snugly in place. I removed all the hardware and cleaned up the longer pulls with Bar Keeper’s Friend. That works great to polish brass. Gloria chose to keep those since she has a lot of gold accent pieces in her bedroom. The brass knobs were set aside, maybe to be repurposed for something later. 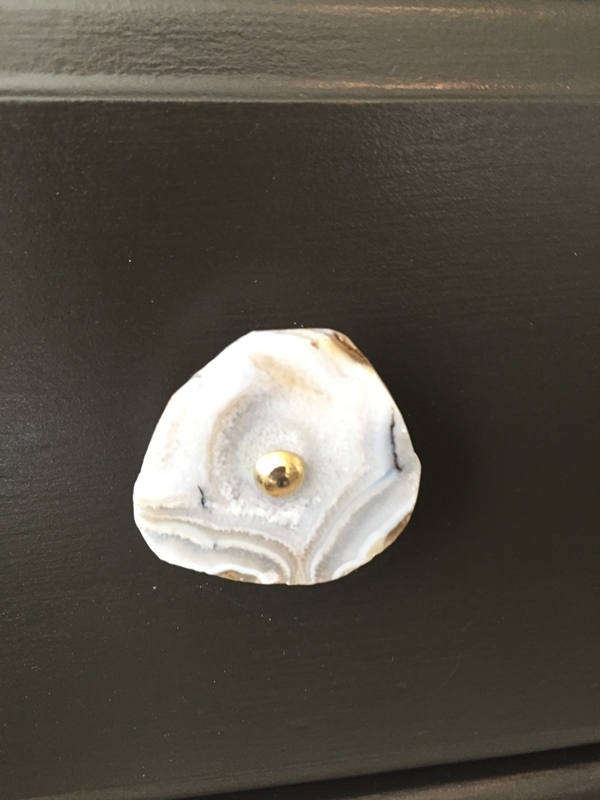 Gloria found Geo Mineral Knobs from World Market that she loves. They give the piece a unique look. Isn’t this pretty? She selected five of them that are all just a bit different while having the same coloring. The top of the dresser was in need of some repairing. The last coat of paint it got covered lots of bubbles and dents. It was quite a mess! The very first step was to try to smooth out the top of the dresser. 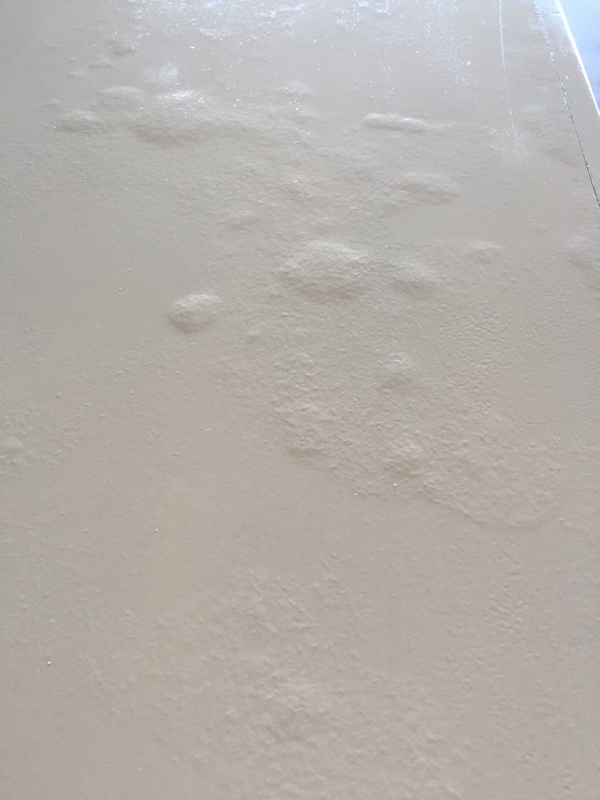 I used my palm sander to remove the paint and to sand it down to a smooth surface to paint. It took about 30 minutes to get rid of all of those bubbles. 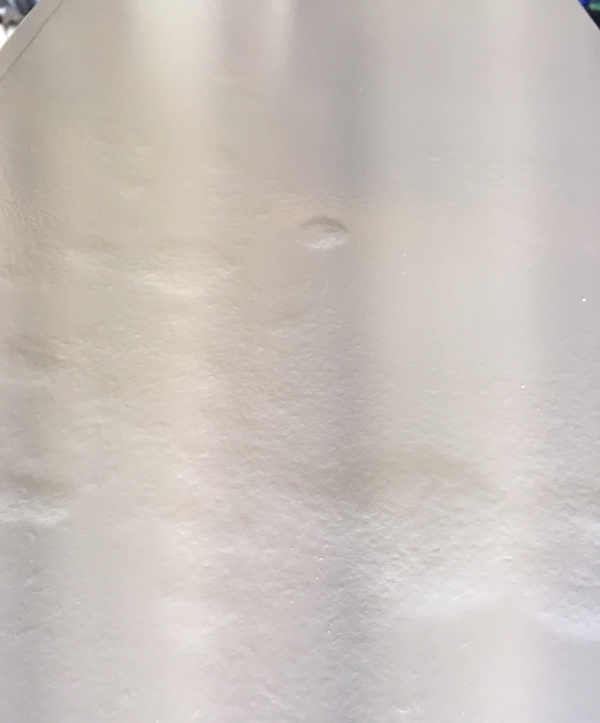 Gloria chose Espresso Beans from Behr in satin as the paint color. It has a nice, dark, rich look to it and matches her other bedroom furniture nicely. It’s paint and primer in one, so I got busy painting. 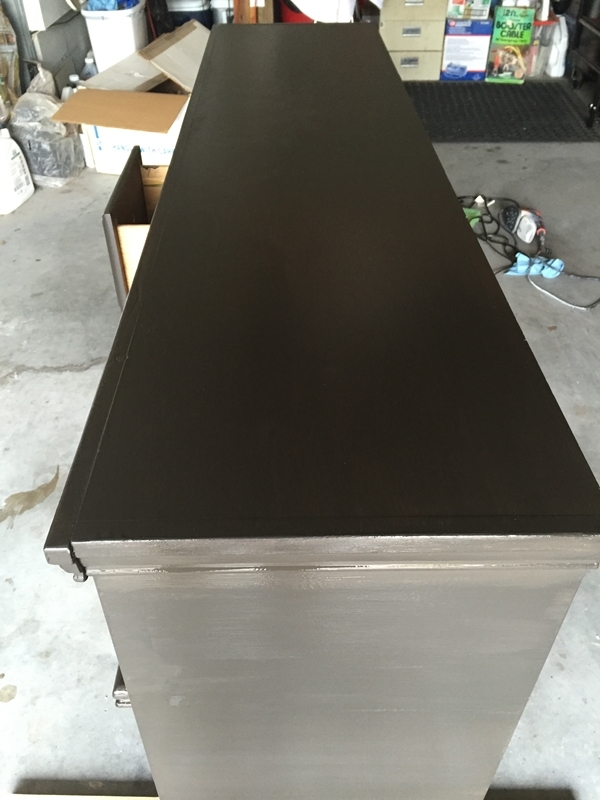 The coverage was great and after one coat, the dresser was looking so much better. I allowed it to dry overnight and gave it a second coat the next day. 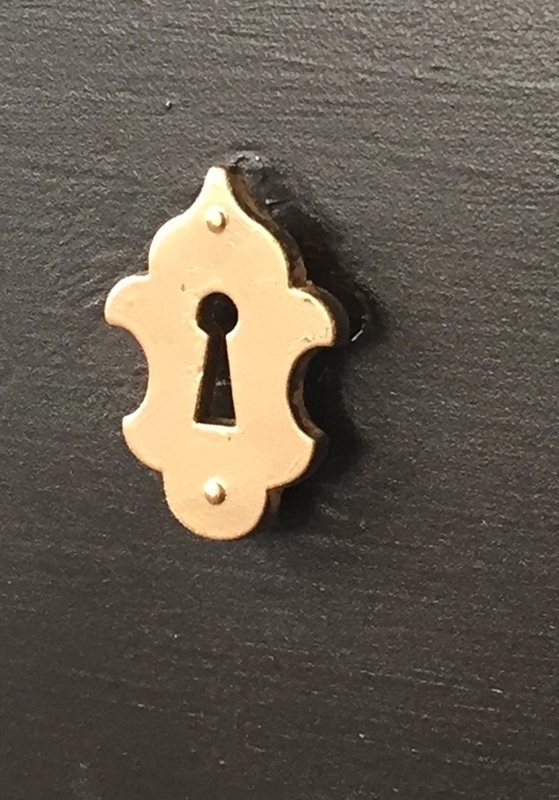 The dresser had two key hole pieces attached to it. I used spray paint to change them to gold. I let it dry overnight again and then gave it two coats of Minwax Polycrylic Protective Finish. I made sure to avoid brushing it on too thickly. I let the first coat dry for about three hours and it was ready for a second coat. After the hardware was reattached and the drawers put back in place, the dresser was ready for its trip to Gloria’s place. She styled it using some gold accent pieces. 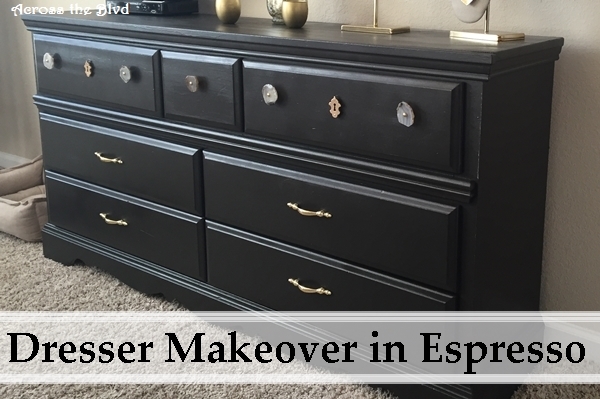 The new look for the dresser gives it an updated look that is much more Gloria’s style. She loves it and I’m happy that it turned out the way she wanted it. I am amazed at your handy work, you made something old, brand new, it looks fabulous. The products they have now on the market make projects like this so much easier. Thanks for sharing on Oh My Heartsie Girls this week, so glad that you did! 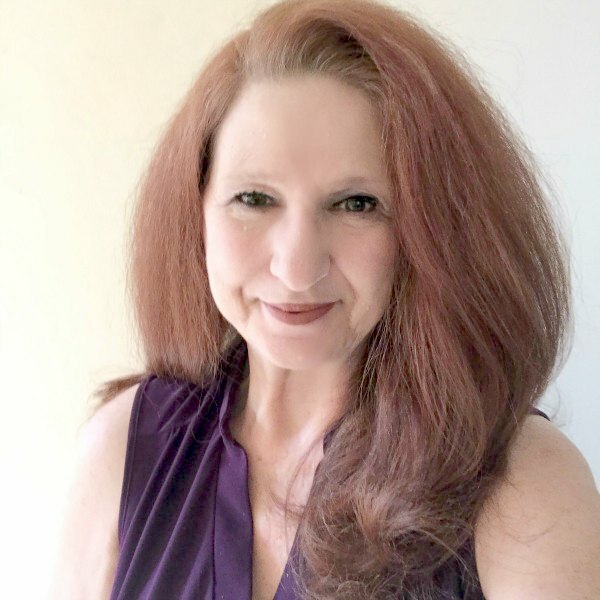 Thanks so much, Karren! It was a pretty easy piece to work with. You’re right, there are so many great products to use that make furniture makeovers so much easier than they once were. Thanks for hosting. I always enjoy your party! I know, right! A little paint and some new hardware can make a world of difference. Thanks so much for stopping by, Mary. 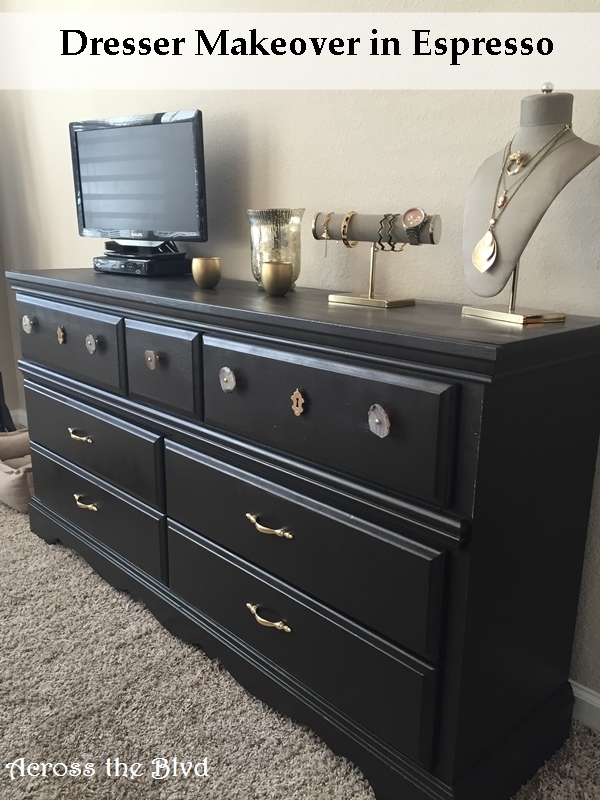 Love the work Gloria has done with this dresser, it looks really classy now! No more bumps or bubbles, and that scalloped bottom is really beautiful. Getting rid of the bumps was a chore, but it didn’t take too long. Gloria was the decision maker about the dresser, but she enlisted me for the work! 🙂 Thanks for the party and for stopping by, Pili. Thank you, Laurie. We were both really happy with how it turned out. Using the palm sander makes it so easy. Those knobs are pretty great. Gloria was happy when she found them. She had seen some on line that were similar at Anthropologie and they were triple the price of these at World Market. Thanks so much for sharing! Wow it looks so much better. Now that the bubbles are gone and it has a sleek new color it looks brand new! Great job. Thank you, Mary! It’s always so rewarding to take an old piece like that and make it look new and fresh. What an fabulous transformation! I really like the new color of the dresser. It looks totally brand new! Thank you! 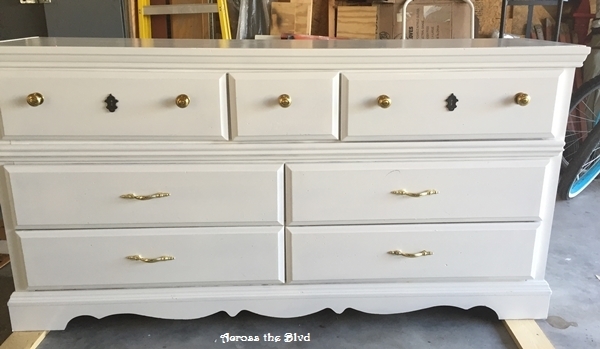 A change of color was just what this dresser needed! Thanks! Those knobs are wonderful. Gloria was delighted to have found them at World Market for a great price. Honestly I can hardly believe you’ve done it yourself! It looks AMAZING !! I can’t even handle a hammer for me it looks like a wonder-work!! Thank you so much, Winnie! It wasn’t too difficult once I got the sanding done. Thanks for stopping by! I love this ! The color is great. Thanks for joining Family Joy Blog Link Up Party this week. Thanks, Charlene. Thanks, too for the party. 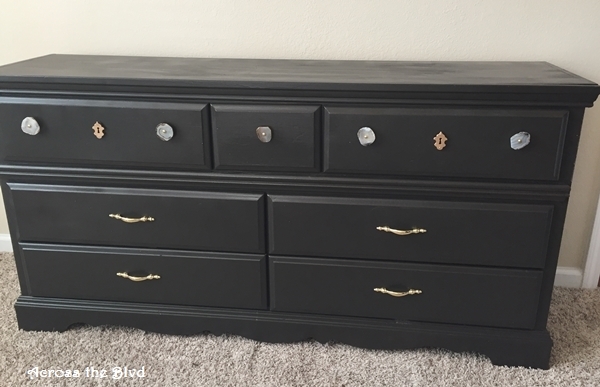 You’ve done a gorgeous job on this dresser! I love that you gave such clear instructions and showed everyone how to work through the issues that could be encountered! 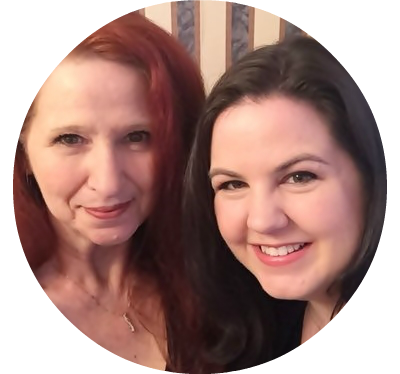 Thanks so much for linking it to us at Throwback Thursday; we’re looking forward to seeing what you’ll have for us next week and we’ll be pinning to our Throwback Thursday board, too! Thank you so much, Mollie!I appreciate that. Thanks for hosting a great party each week! Thank you, Linda. That’s the look Gloria was hoping for when she asked me to give this a makeover. This is absolutely gorgeous! Making me wish for spring so I can get to a couple of pieces I have in my garage! I love the deep espresso-so classic! 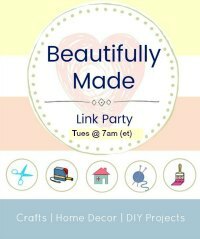 Visiting from the Family Joy linkup! Thanks so much, Alyssa! I’m fortunate that we had a few very warm days so that I could work on this. I love the color, too. Thanks for visiting! I really love the pulls you used! The only piece I ever made over was a baby grand piano. And that was because I had no idea what was involved! Thank you for sharing at #overthemoon. Have a blessed week. Aren’t those great? Gloria was so happy when she found them. Making over a baby grand piano sounds like a major job! Thanks for hosting a great party, Marilyn. Isn’t it lovely when a project comes together so nicely. Your dresser is a great contrast with the floor and walls. I don’t know about you but I think contrasts like that really makes the piece pop. Yes, it is! This one turned out just the way we wanted it to and it does contrast nicely with the carpet and walls at Gloria’s place. I love how this came out. I’m such a fan of dark dresser, so I love your update. Thank you, Lisa. Gloria has dark furniture throughout her place and this now fits in nicely. Thank you so much, Wendy! There is something very satisfying about taking an old piece and giving it new life. It can be frustrating at times and I learn a little with each piece. I knew he could take care of the tracks in half the time it would have taken me! Asking for his advice is a great way to encourage him to help out! What a fantastic transformation. I love dark wood–it’s gorgeous! Thank you, Sherry. The dark wood really does make the piece stand out. Thanks so much, Christine. I’m excited to have the dresser featured at Friday Favorites. Thanks for all the shares! 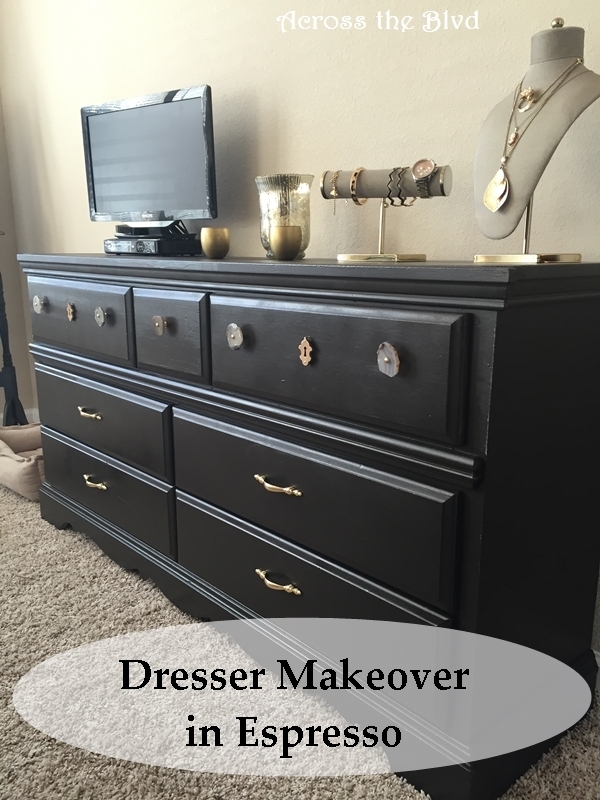 What an amazing makeover for your dresser! I love how the finished product turned out the color is beautiful! Thank you. The espresso color is Gloria’s favorite for furniture. Thanks for stopping by, Jenny. I love World Market, what a great transformation! Thanks for sharing at What’d You Do This Weekend?! We love it too! Thank you, Joy. Thanks for the party each week!